How to help a baby learn to talk? What to do if baby does not talk? What can cause a delay in a baby’s speech and language? How are speech delays in babies detected? How is an infant’s speech delay treated? How can parents help a baby with speech delay? Babies begin with adorable coos and gurgles. As they grow, they start speaking simple consonants and eventually words such as “mama” and “dada”. The next achievement is a string of words that form basic sentences. So, when exactly does this next achievement take place? MomJunction gives you a detailed insight into babies talking, how to improve their talking skills, and in case of delays, how to deal with and treat them. Read on! Babies learn to talk in stages, and surprisingly the first step happens in the womb. Researchers have noted brain activity in the language centers of a fetus’ brain as early as the seventh month of gestation (1). There is a spike in fetal brain activity every time the mother speaks in a louder tone or when she stresses on vowels when pronouncing a word. Experts suggest that the spike is like the baby is having his first lesson in speech and language by listening to the mother’s voice. By the end of gestation, the fetus is quite adept at hearing words. 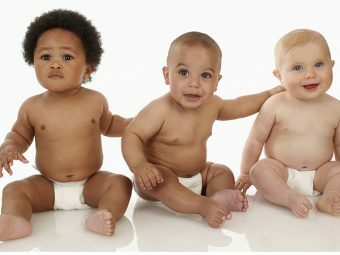 During birth, babies are born with a limited yet significant knowledge, including the ability to distinguish native tongue from a foreign one. Nevertheless, the progression towards meaningful speech happens one step at a time. Babies make their first sounds of coos and gurgles at the age of two months (2). These sounds lay the foundation for further speech development, with the next achievement being babbling at the end of four months (3). Development continues and by 12 months the baby begins to speak some basic words. The first meaningful words come at the age of 24 months (two years), and conversations start at the end of toddler-hood that is 36 months (three years) (4) (5). Just like any other developmental milestone, speech development in babies is a step-by-step process that involves several stages. Here is a speech development timeline with various achievements and progression levels in speech and language development (6) (7) (8). Each stage presents its set of milestones and achievements. Here is what some of those sounds mean. Coos and gurgles: These are the earliest sounds of vocalization. The baby experiments with the vocal cords while using sounds as a way to draw the attention of caretakers. Basic sounds of comfort: You may often hear a newborn break into an “mm” or “ah”. These sounds help comfort and self-soothe the baby. Babbles and mimics: Babbling is speaking random words or consonants mostly by imitating what is heard by the infant. Mimicking is also a way babies learn new words. Vowels and simple consonants: Vowels are easy to pronounce as they do not involve complicated tongue movement. Certain consonants such as “p” and “b” involve a more comfortable forward tongue movement. Such consonants are among the first letters the baby speaks (9). First words: By 12 months, the baby will speak first words with easy to pronounce consonants. So you hear a lot of “mama”, “dada”, “baba”, and “yaya”. The baby will initially speak these words without associating a meaning to them. They gradually get it right and address the correct parent with a “mama” or “dada”. Exclamations: “Uh-Oh” becomes common when the baby topples or drops a toy. Exclamatory phrases are part of the standard vocabulary, and a baby will learn to use them by 12 months. Speaking a few basic words: The first words are going to be the names of the everyday items such as toys, bottle, shoe, etc. A baby will say these words when they intend to use them such as they may say “bottle” when they are hungry. Says “no”: A baby will nod their head from side to side and exclaim “no”. The ability to use single words such as “no” signify a better correlation between language skills and cognition. Copying words: By two years, the toddler would mimic words and conversations that they hear people speaking around them. Earlier, they would merely mimic and babble, but now they make an effort to get the pronunciation right. Speaking up to 50 words: These include greetings such as “hi” and words such as “bye” and “go”. More words lead to the formation of a few meaningful sentences of four to six words. Using pronouns: The toddler refers to themselves and others with pronouns such as “me” and “him/her”. It means they are learning the rules of first and third person. 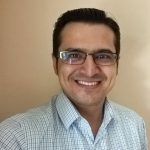 Having conversations: Congratulations! Now you can finally have some meaningful conversations with your toddler. They can pull off a dialogue quite well and their speech development till toddler-hood is complete. Speech development happens best when the baby is given the right amount of encouragement from parents. How Can Parents Help Baby Learn To Talk? The following steps can help your baby develop better speech and language skills. Start baby talk early: Baby talk is a childish way of framing words and sentences to make them more appealing to a baby. Start baby talk early, like in the first three months so that they can grasp bits of language. Research shows that babies, who indulge in baby talk earlier in life, have a wider vocabulary by toddler-hood (10). Read and sing: These stir the little one’s interest towards words and sentences. Dedicate adequate reading and singing time for stimulating language development. Encourage imitation: Let the baby copy your words and babble them out loud. 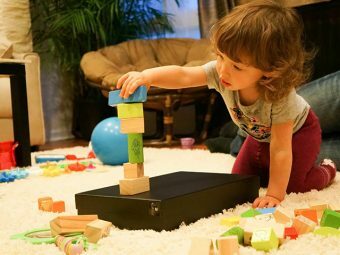 It may sound gibberish, but as the baby steps into toddler-hood, their copying would become more accurate, and lay the foundation for meaningful sentence formation. Describe people and objects: Point at objects and tell the baby their names, and introduce the baby to people with their names or relation. Using nouns strengthens object-noun association and significantly improves a baby’s vocabulary. Ask questions and have conversations: Once your baby is a toddler, ask them questions when they want something or come to you with some problem. Questions work as stimulants to make the baby think for an answer. By three years, you can have some lengthy conversations that further polish their skills. Use a language that you are most comfortable with: The American Speech-Language-Hearing Association (ASLHA) recommends parents speak to their baby in a language they find convenient such as their native tongue (11). It helps reduce language clutter for the baby while also letting parents assess their baby’s progress. These measures would ensure that your baby develops language skills easily. But you must clear any roadblocks along the way. Let the baby experiment: Allow the baby to take time to learn and try the new words that they have just learned. Let them experiment with the consonant sounds, combining them to improve their skills. Turn off background noise: When reading and singing to a baby, cut down the background noise from radio or TV. It helps the baby stay focused on the activity and prevent distractions. Limit screen time: The American Academy of Pediatrics (AAP) discourages the use of digital display by toddlers below 18 months except for some video-chatting once in a while (12). Extensive research demonstrates that babies who spend a lot of time with screens (TV, smartphones, and tablets), have delayed language development (13). The time spent by the baby or toddler on a screen could be better spent in verbal interaction with parents. There could be scenarios when a baby does not seem to be on track with language development. But, you can work towards improving it. What If The Baby Does Not Talk? Sometimes, babies do not seem to maintain pace with language development. But some delay is not alarming. Delay in talking is not always an indicator of a problem. Some toddlers just take additional time than others. You need to be patient and encourage the little one (14). Premature babies may talk later: They may not start talking at the same age as a full-term infant. Do remember that premature infants just take a bit longer than regular infants to learn language skills, but pick up eventually. (15). Maternal and neonatal problems can delay speech: Complications such as maternal infections during pregnancy, neonatal infections, drug side-effects, and even poor health and weight at birth can delay speech development (16). Such babies have a slower progression rate when it comes to overall language skills. If you doubt undue delay in speech, then look out for signs of delay in speech and language development in infants. AAP states that one in five toddlers display some delay in speech. But in most cases, the delay is temporary and is overcome by the toddler as they grow. However, if there is an actual delay, then the next section can help you understand what causes them. Autistic spectrum disorders: Infants with this disorder may have limited vocabulary and trouble understanding words with multiple meanings. An autistic toddler will be unable to sustain a conversation. However, not all cases of autism lead to delay, and some with a minor level of autism can have normal speech skills (20). Hearing disability: Since verbal language is learned through hearing, any problem with the ability to hear has an impact on speech development. Hearing problems can range from congenital ear defects to injuries that impact the ability to listen (21). Neurological disorders: A myriad of neurological problems, cerebral palsy, innate intellectual disability, and auditory processing disorders, can cause speech delay. Most of these conditions also affect the ability to listen. In disorders such as apraxia of speech, the brain is in a normal state with there being a problem in motor neurons that control jaw movement (22). Behavioral problems: Some toddlers display restricted speech only in a specific environment such as at school or daycare. It is called selective mutism. The baby/toddler would otherwise be healthy and would only require counseling and self-confidence reinforcement to be able to speak normally. The condition is very rare affecting less than 1% of individuals with mental health problems (23). If you suspect a delay, take the baby to a doctor right away for an assessment. If a pediatrician suspects speech problems, then the baby is referred to a speech-language pathologist, who specializes in detecting speech delays in infants. A series of tests help determine any speech and language delay. Here are some parameters assessed in such tests. Hearing abilities: The inability to listen properly can interfere with the ability to learn a language efficiently. Therefore, it is the first test performed by the expert. Physical deformities: A deformed palate or lip can hamper speech. The baby is checked for the presence of deformities in the oral cavity that could potentially cause speech delay. Receptive language: It is about how well your infant can understand and interpret verbal communication. Expressive language: It is about how much a baby can talk and how many words he knows. The clarity of speech is also assessed. Use of gestures: Does the baby always prefer gestures over verbal communication? It could be a sign of problematic speech development, and the pathologists look for this symptom. After a thorough testing and analysis of the results, the specialist will arrive at a diagnosis. If the baby is detected with a problem, then it would be followed up with treatment. Surgery for hearing or oral deformity: An operation could be performed if the baby has problems in hearing or deformities of the mouth. If a baby needs a hearing aid, then he will be given one. Treating these causes for speech delay would ensure the success of the subsequent steps. Language training: The baby is trained through the use of music, songs, conversation, and books. Language skills relevant to the baby’s age are imparted through a series of sessions at the language expert’s clinic. Pronunciation is polished through the use of repeated conversations. Oral conditioning and strengthening: Jaw exercises are taught to improve the function of the mouth that help correct speech. The therapist may use exercises in conjunction with food to help the baby perform these exercises correctly. The duration of the treatment and its specific steps would depend on the exact speech problem faced by the infant. Parents, too, can play a role n helping the baby recover from speech delays. Talk and pretend to have a conversation: Young babies do not understand words, but hear and respond to sounds. Start baby talk early and have a conversation whenever you communicate with the infant. It may not seem much, but this lays the foundation for an active speech later. Count numbers; name objects: When counting the number of the blocks he stacked, say the numbers out loud so that the baby can hear. Point to objects and say what they are called. Address relatives and other people around by their names or relation. Ask questions: Older infants understand questions, so ask them what they want. If he cries or throws a tantrum, then ask the reason behind it. Questions help stimulate an infant to use speech as a medium of expression over simple gestures. Read to your baby: The AAP recommends reading, especially storybooks, to infants (26). Use books rich in pictures and point at the illustrations to name them. As the baby gets older, let him take the initiative to choose a book to read. Singing nursery rhymes is fun and easy: Do not underestimate the power of nursery rhymes. They may seem gibberish but are an excellent tool to stimulate the baby’s language-learning skills. Sing children’s songs and nursery rhymes aloud and prompt the baby to sing along. Younger infants make simple sounds, while older ones would try pronouncing the words. Either way, these habits nurture the baby’s speech. As parents, you may have a lot of questions in mind. And, we have covered a few common ones in the next section. 1. How soon can babies talk? The earliest a baby can babble a few words is at the age of seven months. However, more meaningful pronunciations happen only after the infant steps into toddler-hood that is at 12 months (27). 2. Are speech and language development different? Speech is the ability to communicate through verbal articulation. Language encompasses all forms of communication, including verbal, non-verbal, and written. Babies cannot write, which is why non-verbal communication is mostly used by newborns. It means verbal language or speech is the only form of communication that displays gradual progression just like other developmental milestones in a baby’s life. 3. When do babies start talking fluently? Proper talking skills develop between the age of four and five years, and by the fifth birthday the little one would chatter quite fluently (28) (29). 4. How are speech delays evaluated? Developmental delays in speech are diagnosed and evaluated using tests that assess the baby/toddler’s response to questions and words. Usually, such tests are administered by a speech-language pathologist, who is able to determine the precise reason for speech problems in the baby. 5. Can speech delay be cured? It entirely depends on the underlying cause. Some conditions such as autism have no cure, but can be managed successfully through lifestyle interventions. Problems such as apraxia of speech can be cured with some physiotherapy. In any case, early detection and timely intervention can help the baby have a normal speech with few hindrances. 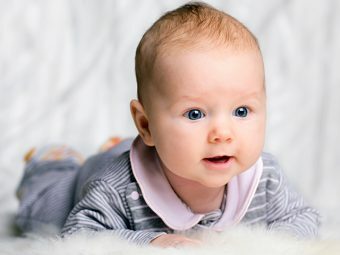 Babies are instinctively tuned to learn to talk, and experts state that they are genetically predisposed to talk irrespective of the stimulus used (30). Nevertheless, providing the right kind of stimulation can help them fare better. Be watchful of delays and let the baby talk. All these efforts let your baby grow up to be quite the chatterbox that toddlers are known to become! Have any more tips on improving and stimulating speech in babies? Then, tell us in the comments section below. 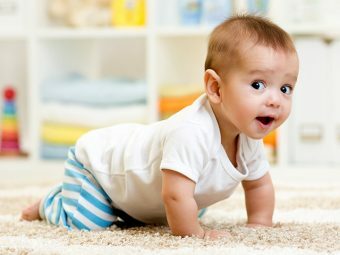 How To Help A Baby Crawl? What Eye Color Will My Child Have?